Tonight, I'm excited to bring you TWO brand new book giveaways - one for the gals, and one for the guys! I was really interested to read Dr. Emerson Eggerichs's brand new book, Mother & Son: The Respect Effect. Many of us are familiar with his bestseller on successful marriage relationships, Love & Respect. This book continues on with the same topic: women need love, and men desire respect. Instead of focusing on a marriage relationship, Mother & Son focuses on how a mother shows her son respect. Eggerichs suggests that this is the key to a boy's heart. Give so a child's basic physical needs can be met. Understand so a child is not provoked or exasperated. Instruct so your child can know and apply God's wisdom. Discipline so your child can correct poor choices. Encourage so your child can courageously develop God-given gifts. Supplicate in prayer so your child can experience God's touch and truth. While Eggerichs' theory on respect often feels contradictory to how we, as mothers, feel about loving our sons, the book is extensive in its examples and explanations. It explains, in depth, how to give respect to your son at any age. Pick up this book at any major bookseller, like Amazon. And visit the website here. Enter for a chance to win Mother & Son by using the Rafflecopter below! Steve reviewed the second book for me, Wise Guys, by Kent Evans. The concept is simple: we, as men who want to succeed, need to seek out and ask older, wiser, and more experienced men what their secrets to success have been. Somewhere along the line, coinciding with the epidemic we face today with broken families and absentee fathers, sons stopped learning these secrets from their fathers. Kent Evan's Wise Guys: Unlocking Hidden Wisdom from the Men Around You doesn't deviate very far from that basic premise. The book is constructed as a collection of personal vignettes, all showcasing one or two foundational life-lessons Kent learned from different mentors throughout his professional and personal life. For example, he begins with the foundational advice of “stop trying to not do this or not be that. Instead, find some men who have the life you want, and figure out why their situation is the way it is . . . learn from them and then model yourself after the parts you like.” From there, he covers relationship help, spiritual guidance, successful business practices, gentle correction/rebuking (and taking it to heart when you're on the receiving end), humble deference to others, fatherhood, and more. The book is relatively short, with seventeen chapters that each read in a matter of minutes. Each chapter ends with discussion questions used to support the main idea, and can also contribute to building a deeper Bible study. This is a good starting point for young men and new fathers looking to make good decisions in their lives. Used as a segue into continuing discussion and deeper Bible study, it is a great resource to have on-hand. Buy this book on Amazon (it comes out on Wednesday), and visit the official website here! Enter for a chance to win Wise Guys by putting your name in the Rafflecopter below! Last Friday, Nolan, Ephraim, and I visited our friend Jeanie! Jeanie and Rod live out in the country, and they have fun toys at their house for when their grandchildren come to visit. N & E had a field day! They love playing in the sandbox boat! And the motorized John Deere tractor was a huge hit. Trusting a two-year-old on a pedal-controlled tractor makes my heart race. He did pretty well though! I love this shot. Eating mac 'n cheese and summer fruit outside. Mmm! Saturday marked TEN YEARS since the day that I met Stephen. In some ways, it feels longer than ten years, and in some ways, ten feels just right. May 21, 2006 was one special day in my life. Things just keep getting better with this guy. Sunday afternoon, we checked out a local kids' carnival. Since it was a rainy weekend, some of the activities were cancelled, and the rest were inside. The boys enjoyed it though. Cherries were on sale, and I had to buy a bag! There is nothing more summery to me than a bowl full of cherries. 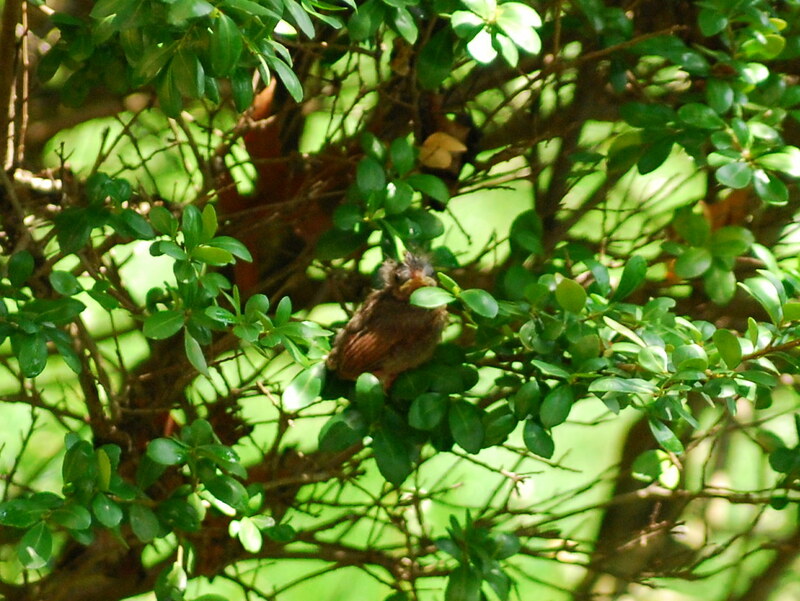 Our baby robins fledged from the nest on Monday. Yesterday, I spotted the baby birds in various places around our yard, so it's fun they are sticking close by. They have gotten so big! 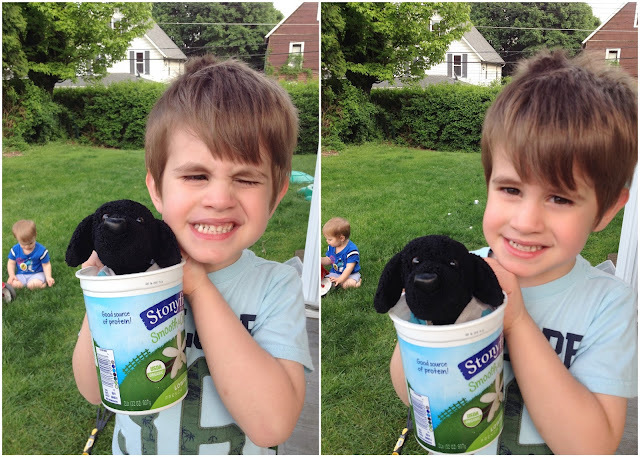 On Tuesday, we had a MOPS playdate at the park with over twenty moms and more kids than I could count. Here's Nolan on the Merry-Go-Round with some of his girl friends. And Ephraim was enamored with the Paw Patrol chalk. On Wednesday afternoon, the weather was so gorgeous! I woke Ephraim up from his nap (I have to do that almost every day because he loves to sleep until dinnertime) and brought him outside. He tried to fall back asleep in my arms, and it was a flashback to how sweet it was when he slept on me all the time as a baby. Nolan kept saying it was Hammie's birthday yesterday. I think it's the second time this year that Hammie has had a birthday, but we celebrated anyway with some chocolate chip cookies. I'm hearing that we're getting some storms this weekend. Say it isn't so! Sweet boy always trying to bend the rules by flashing me cute smiles. Hope you enjoy this long Memorial Day weekend! May it be filled with barbecue and sunshine where you are. 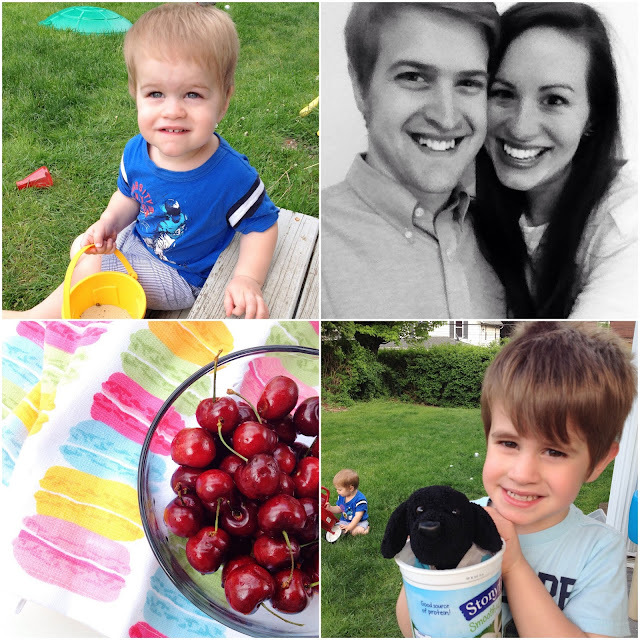 Sorry for the crickets on the blog this week. Last Friday, I went to upload my photos from my phone, and it just would not work. Luckily, this Friday, it's not a problem! We've had a low-key week - hanging out at home, running errands, and playing with friends at the library. 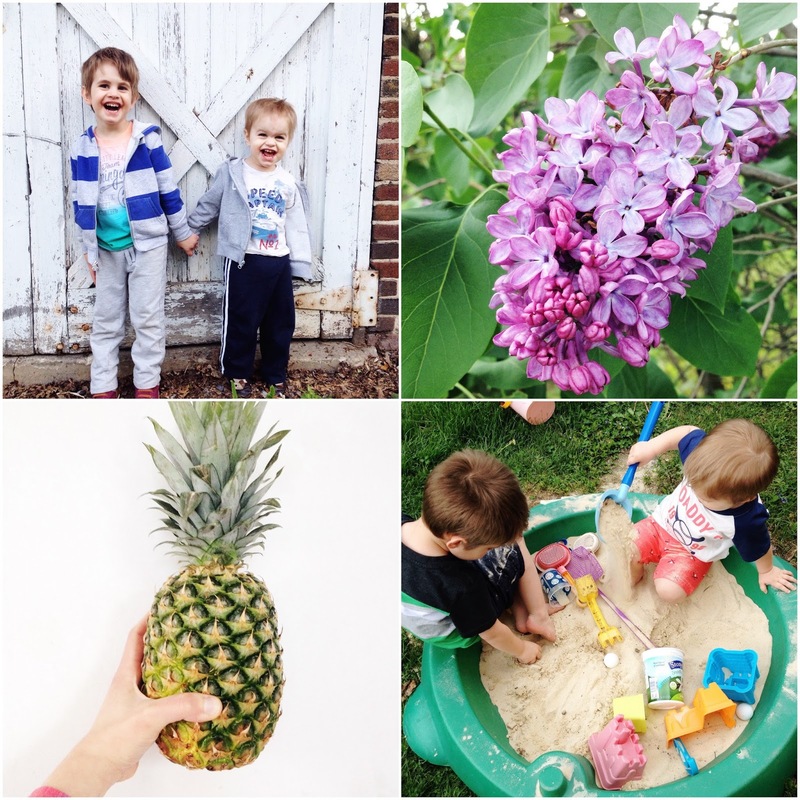 It seems the boys do much better on days that we fill with activities, so I am going to start planning out our summer with plenty of things to do! We've had our share of cold and rainy days, so any time we see the sun, we all run outside! 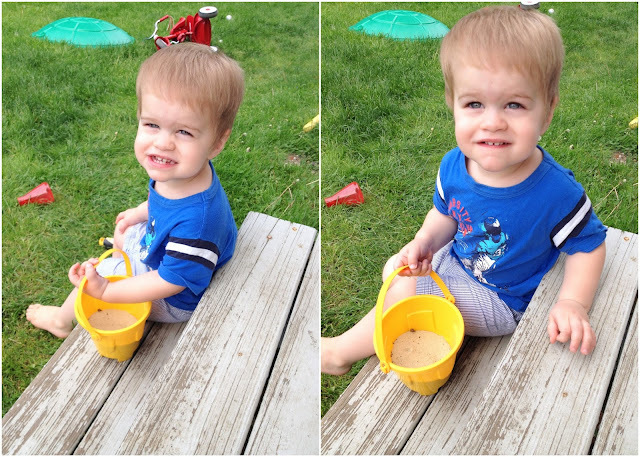 With growing boys and all those toys, I'm thinking we could use a second little turtle sandbox! Nolan's been my little helper when it comes to gardening. He tries to help weed, and he loves to water the new sprouts. He has a small green watering can that he begged for at Target. One day this week, I was letting him fill it up multiple times in the house. After a while, I realized he was filling it up with super hot water! So far, our plants are still alive :) He also REALLY wanted gardening gloves, so we found a pair of Mickey Mouse ones at Lowe's last night, and he kept saying, "I am so happy! I'm so happy!" I'll have him help me plant the rest of the seeds tomorrow. Lovely lilac bushes in our neighbor Yvonne's yard. All I know is, thank goodness this boy still loves to nap! I didn't peek on them for several days, and now they look like this. They are so fluffy and feathery! They will probably leave the nest on Sunday or Monday. Oh, and I have to show you the photos of the cardinals, too! The babies fledged (left the nest) last weekend. And one baby right before he took his first flight :) He landed immediately on the ground, and then waddled all the way over to another bush to his family. It was such an amazing experience to watch it all unfold. I miss having them in our yard! I've been doing my first Beth Moore Bible study with a couple of friends, and I'm really enjoying it! She is such a dynamic speaker, and the book is written really well, too. On Sunday, E and I were waiting for Steve and Nolan in the church parking lot, and one of my favorite songs came on. I started singing along to try and entertain Ephraim, but I turned around and he had his hands over his ears :) He is much too young to have an opinion about my singing! I can't get enough fresh pineapple! I don't buy much fruit in the winter, so I'm really excited that some of our favorites like strawberries and blueberries are coming into season. We've been taking a lot of nightly walks, and this was from last night. It needs a frame :) These boys are a handful, and they keep us on our toes, but they are the two cutest humans I've ever met. Preheat the oven to 325 degrees. In a large bowl, beat the eggs on high speed until foamy. Beat in the flour, sugar, and brown sugar until well-blended. Add in the softened butter. Stir in the chocolate chips (and walnuts, if desired). Pour the batter into the pie shell. Bake for 50 minutes to one hour. Serve warm with a scoop of vanilla ice cream. 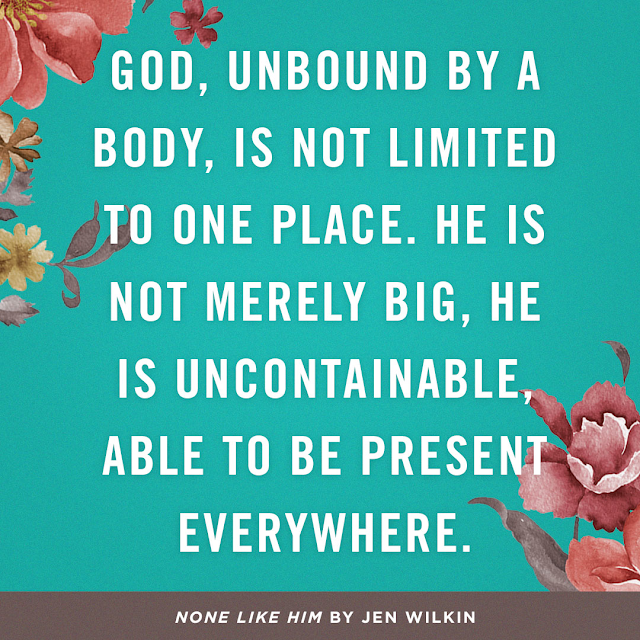 I received a copy of the new book, "None Like Him: 10 Ways God is Different From Us (and why that's a good thing)" by Jen Wilkin. The premise is that as humans, we can never fathom how BIG our God is. As Christians, we continually pursue God, reading and learning more about Him, communing with Him. But we have to also understand that we will never be able to comprehend ALL of Him because He is limitless. The "10 Ways God is Different From Us" are separated into 10 chapters. Jen does an amazing job at explaining what all of those big words mean, and she emphasizes that we can never be any of those things. People can be holy, loving, gracious, faithful, and righteous, and many other good things that reflect God's character. But unlike God, we have limits. And Jen suggests there is much freedom in letting God be God, and resting in that. Jen uses personal stories and pop culture references to help illustrate what we are like versus what God is like. It's enjoyable to read, and it's very Biblically based. At the end of each chapter, there are verses for meditation, questions for reflection, and prompts for prayer. I could see this book as a great focus for a women's Bible study or small group. Purchase Jen's book here (Amazon). And enter to win a copy by using the Rafflecopter below! 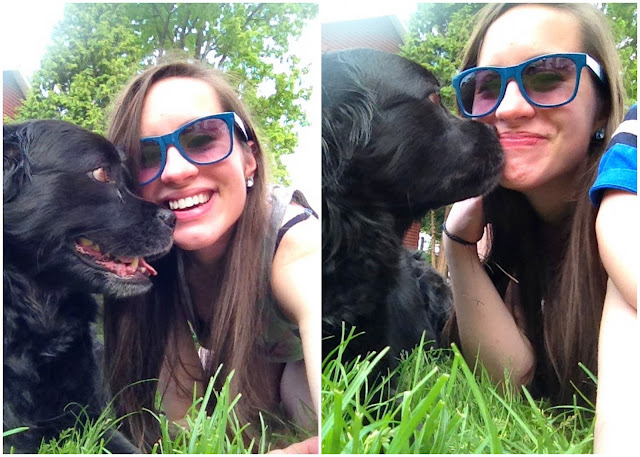 It's a sleepy Monday afternoon at our house, and I wanted to post a few of my favorite photos from this weekend! My family made me feel very loved and celebrated yesterday on my fifth Mother's Day. I feel so very grateful for these two little boys, their daddy, and our life together. God is so good. These pink tulips - have you ever noticed the purple stars and the purple pollen on the inside? So gorgeous! We had a steak dinner with my mom and Don on Saturday night. And then yesterday, we had lunch with Steve's mom and dad. It's so nice to be with both of our moms on Mother's Day weekend! And Steve snapped a few photos of the boys, which turned out adorable. Lastly, I've been watching the robin's nest all weekend, and finally this morning I peeked at these three tiny babies! They are so brand new that there is even a speck of blue egg shell on one's pink skin. One egg hadn't hatched yet, but hopefully it has now! Come back tomorrow, I have a book giveaway for you!